When you write pony books, it makes life much easier if you have ponies trotting through your own consciousness: the Black Boy you learned to ride on, or the evil Benjamin who dumped you on your first riding lesson. 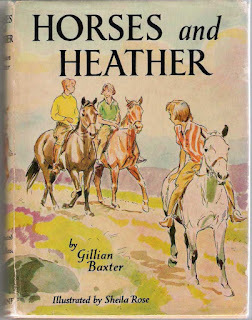 When I talked to her, I was struck by just how many of Gillian Baxter’s equine characters were based on her own horses and ponies. Her books are full of ponies she has known or owned. But ponies weren’t always part of her life. None of her family were horsey, but her grandmother used to tell Gillian stories of horses. ‘One used to pull my great-grandfather’s cobbler’s cart around big houses in the Midlands, where he would fit shoes for everyone; from the maid to the owners of the house. The horse was called Bob, and he was terrified of steam-engines and newspapers. I think that was the start of my fascination with horses.’ Gillian went to a convent school, and then Camden School for Girls in London – not to a boarding school, which I asked about as I wondered if the school Roberta and Ellen go to in Jump for the Stars existed. It did, and was based on one a friend of Gillian’s went to, out of which she used to sneak on regular occasions. I asked Gillian if she had ever done this but she laughed and said she was rather more law-abiding! Gillian first started riding when she was 12 at the De Vere Stables in Kensington, London. Kensington was as built up then as it is now, and so most of Gillian’s early riding experiences took place in about as urban an environment as you can think of: one very, very far away from the traditional rural idyll of most pony books. Once she started riding she rode many of the De Vere Stables’ own ponies, but also kept her first pony, Tommy, there at part-livery. Tommy, a 14.2 bay cob, was ‘lazy but nice-looking.’ Did he ever find a spark, I asked, imagining Gillian careering round Hyde Park. ‘No!’ she said. ‘He never changed!’ She told me about some of the ponies she had ridden who treated Hyde Park without sufficient and proper respect. Amber, one of her favourite ponies, did apparently ‘career around the park, but she wasn’t as bad as one pony I knew who got loose, jumped the railings into Park Lane and was eventually banned from the Park by the police.’ Unlike Gillian, I learned to ride in the country so had room to spare when ponies cared off with me. Had I ridden in Hyde Park I think that I, like the Bad Pony, would also have been banned. By the time Gillian and her family moved to Surrey – Gatton Park near Reigate – she had well and truly left school. 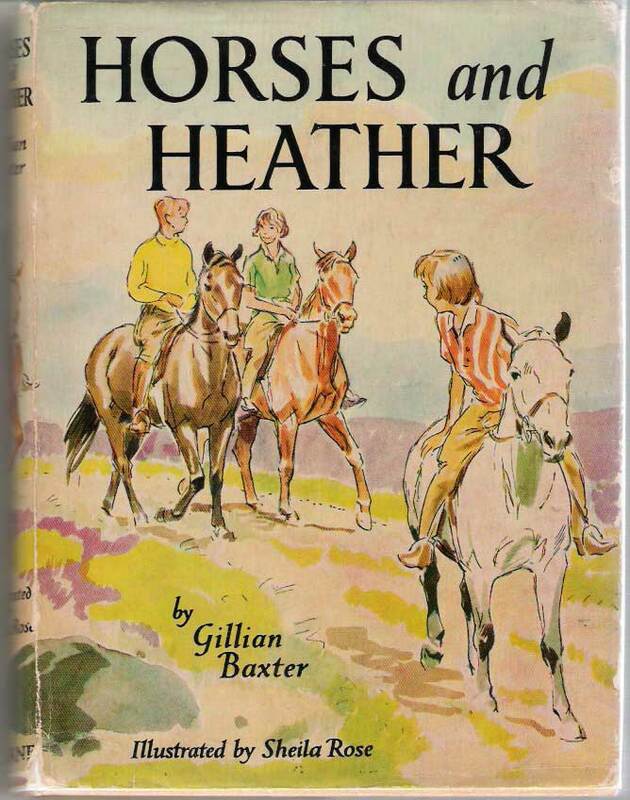 ‘I didn’t,’ she said, ‘go to school as much as I should have, and I left as soon as possible.’ She had already had a book published, Horses and Heather (1956), which appeared when she was fifteen. 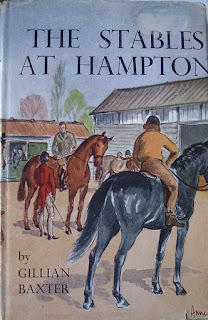 It is set firmly in the countryside, and concerns the adventures of a group of children who achieve that pinnacle of childish horsey ambition: running the riding school. Gillian’s early literary endeavours, however, were concerned with much smaller animals. ‘I always wrote,’ she said, ‘but I started by writing stories about guinea pigs and mice. I had a lot of small animals – at one point I actually had over 100 mice! I was always writing when I was a child, and even more so when I got my first typewriter.’ Gillian’s mother also wrote, and had some children’s stories published in ladies’ papers, so like the Pullein-Thompsons, Gillian had maternal encouragement. Her parents were thrilled when her first book appeared. The books Gillian wrote over the next ten years were unusual because she focussed on teenagers and girls in their early twenties. I asked why she wrote about teenagers when so many authors wrote about younger children. ‘I wrote about the age I knew and stayed with them as they grew up. I think it’s important to go with your characters.’ She was lucky with her publishers: not all were happy for their authors’ characters to age. After the Noel and Henry series, Collins forbade Josphine Pullein-Thompson from writing another series where the characters aged. Gillian’s publishers, Evans, were already publishing Lorna Hill’s Sadler’s Wells ballet series, in which the heroine Veronica not only ages, she has a child, so presumably didn’t have Collins’ objections. 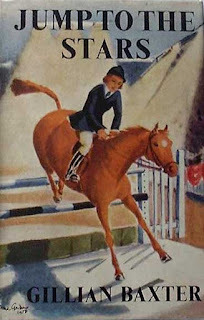 The next book to appear after Horses and Heather was the start of the Bracken Stables series, Jump to the Stars (1957). Gillian wasn’t writing full-time at that point, but had to fit writing between her two jobs, working for Country Life magazine as a typist, and driving her father (an economist) around the country. Her heroine, Bobby, goes, over the course of the series, from school girl to professional rider who is about to marry Guy. And there the series ends … leaving many of us champing at the bit wondering what happened next. What happened next never made its way into a book (although Gillian when I spoke to her was toying with the idea of putting it there), but the story was all there in her head. Bobby and Guy marry, and have twin children, a girl (keen on horses) and a boy (not). Shelta is in foal, but to a half-wild Gipsy cob. She eventually has the foal after a difficult birth, and the boy bonds with it. Gillian’s last pony book, Bargain Horses (1992) came about when J A Allen asked her to write a book for their Junior Equestrian Fiction series. It’s the story of Mary Conway and her daughter Gemma. Mary is determined to prove to the world that she can train event horses, but it is her daughter who has to suffer the difficult, and sometimes downright dangerous, horses her mother buys for peanuts. ‘Some aspects of the mother and daughter in the story are based on me and my daughters, but I don’t think I was anywhere near as pushy as the mother, though I have seen a lot of very pushy mothers as both my daughters ride: one events, and one does dressage and jumps. The horse Weston was based on a big strong horse my daughter and I had to give up on.’ Gillian still rides and has horses about the place herself. When I spoke to her last, she had just come in from trying to get one of her daughter’s horses to load into their new horsebox, which ended, as she said, with her swinging from his head. She now lives in Pembrokeshire, and has four horses of her own and one who is retired – he is a pony left over from when she did trekking. 13.2 Nimble once distinguished himself by taking off with a trekker and jumping two cattle grids, by which time his rider had wisely baled out. Horses are still very much part of Gillian’s life, and she still loves writing. She has just brought out With Vacant Possession as an e-book.